British and Anglo-Saxons around 500 AD (map copyright: Ian Mladjov). King Arthur’s deeds belong to the major national legends of Britain. The exploits of the Knights of the Round Table, the shining Camelot, the noble and benevolent king and his blessed reign, his queen Guinevere, his knights Lancelot, Parsifal, Bors and others, are now a major part of the world cultural tradition. Aside from the romantic late medieval atmosphere that Geoffrey of Monmouth infused to the Arthurian Legend (who first narrated it in the 12th c. AD in his book “History of the Kings of Britain“), the historical reality was very different. In 407 AD the Western Roman Empire withdrew its last regular soldiers from its British provinces. The Roman emperor advised the British Celts and the Romano-British to arrange themselves for their defense against the Anglo-Saxon, Pict (of Caledonia/modern Scotland) and Irish raiders who ravaged their territory. The Romano-British and British warlords followed his advice and elected a Duke – a military leader – possibly with the title of the “Supreme Ruler” or “Supreme Commander”, whose duties was to resolve their disputes and lead the war effort against the invaders. Vortigern, the warlord of the Ordovices/Pagnenses (a Celtic people in Powys, modern Central Wales), was a well known Supreme ruler/commander of Britain during the 5th century. He relied mostly on Anglo-Saxon mercenaries to repel the invaders (and their Anglo-Saxon compatriots too) and to impose its authority. 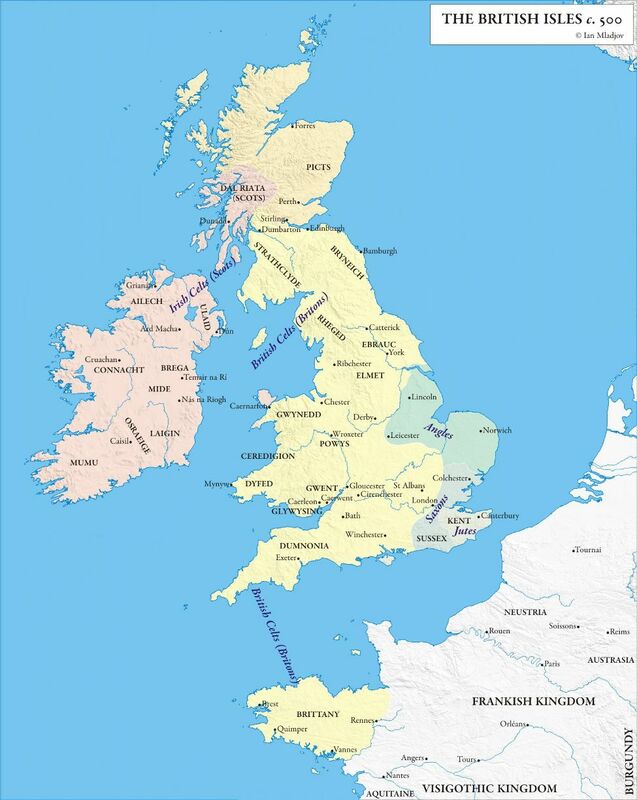 The term “Anglo-Saxons” is the modern conventional name of a major tribal union of Germanic (and a few Slav) invaders in Britain, originating mostly from modern Northern Germany, Netherlands, Jutland (Denmark) and Norway (the latter not to be confused with the Viking Norwegian colonists of the 8th-10th cents AD in the British islands). This tribal union consisted of Saxons, Engles (in Germanic: Engeln, in Byzantine Greek: Inglini), Frisians, Jutes, Proto-Norwegians (Northwestern Scandinavians), Angrivarii, Brukteri (Boruktuari), Westphali (Westphalians), Ostphali, Franks, Thuringians, Wangrii and others. The more numerous among them were the Saxons, thereby the Anglo-Saxon group is often called only by their own ethnic name (Saxons, named by their fierce Germanic war knife, the ‘Sax’). 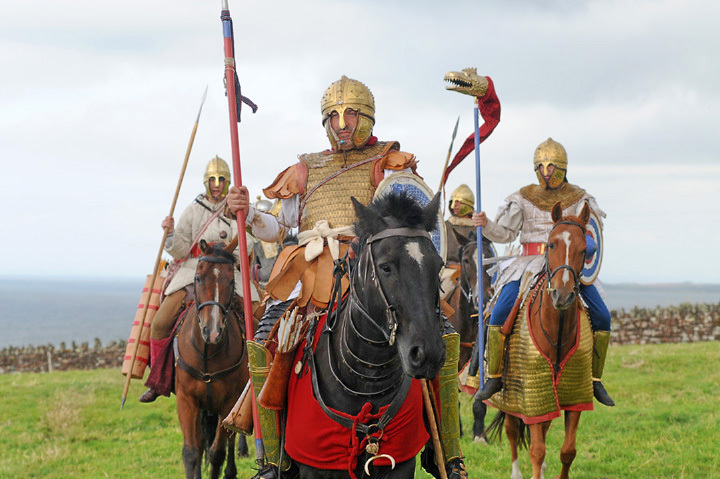 A representation of Arthur and his Late Roman/Romano-British heavy cavalry (“Knights”) by the British Historical Association Comitatus.. Note the ‘Draconarius’ standart-bearer, bearing the Sarmatian standart of the Dragon.